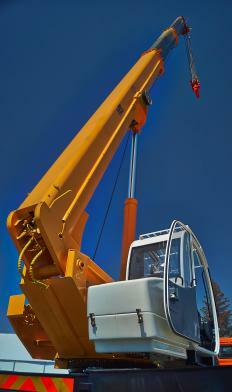 Mobile crane operators must be able to both drive the vehicle and operate the crane. Mobile cranes are heavy machinery that feature a crane for moving large objects; the crane is mounted on a movable vehicle, very often a rubber-tired truck, so the crane can be moved from one location to another either bearing a burden or folded down and empty. A mobile crane operator is the person who drives the crane and operates the crane apparatus. He or she must be trained in the basic operations of the vehicle, as well as safety maneuvers and other precautions. A person working within a construction company may be qualified to act as a mobile crane operator as well as an operator of other machinery. In order to operate a mobile crane, the mobile crane operator must first and foremost possess all the proper credentials. In the United States and some other countries, the operator will need to obtain a commercial driver's license, or CDL, before he or she can drive the crane vehicle. There are several levels of CDL certification, so the mobile crane operator will need to obtain the most appropriate certification as designated by the employer or state and national requirements. Once the operator obtains the CDL and has had plenty of practice driving the machine, he or she will have to undergo training in the specific operation of the crane. The crane itself is often operated from a separate control cab mounted on the vehicle instead of being operated from the driving cab of the crane. The mobile crane operator will need to learn how to properly position the vehicle, park it, stabilize it, and then change to the operating cab to begin using the crane apparatus. The controls in the operating cab will all have specific functions, and the mobile crane operator will need to know how to use all of them properly. Some crane operators will attend training classes that dole out official certifications for crane operations. In some regions of the world, however, specific certifications may not be necessary, so the operator may be trained on-site to begin operation of the crane as soon as possible. Operators who are trained in crane operation will often do classroom work, then on-site practice under the guidance of an experienced crane operator before he or she is able to operate the crane alone. Safety training is essential, and the operator must be trained on what to do should the crane tip, or if other emergency situations arise . How Do I Become a Crane Inspector? What Does a Crane Driver Do? How Do I Receive Crane Operator Certification? How Do I Become a Crane Driver? What are the Different Kinds of Mobile Home Foundations?